Posted on 19th April 2017 by admin. We all have favourite films which we love to re-visit and once again, feel the magic and excitement we remember from the first viewing. And the continued rise of TV technologies that promise home cinema experiences is constantly making this a more affordable and realistic proposition. We recently experienced a demonstration of the latest Panasonic 4K UHD ‘DX’ series of televisions, featuring Ultra High Definition resolution, High Dynamic Range colour and contrast and Panasonic’s latest innovation: ‘tuned in Hollywood’. The clever boffins at Panasonic have incorporated a picture technology which claims to have been tuned by Hollywood experts and as such, offers a picture performance that’s ‘True to the Director’s Vision’. 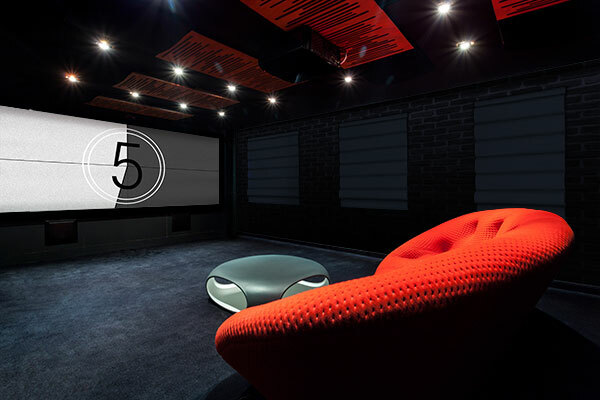 While we can’t argue with the picture quality of such TV’s, the true home cinema experience is something which relies, fundamentally, upon recreating the dark, atmospheric surroundings of a real cinema, where stray light isn't able to affect the image. With Controliss battery powered and mains powered electric blinds, you can create exactly that, with the option of light-blocking blackout fabric available on a number of styles in our roller blinds, roman blinds or vertical blinds ranges. And with the practicality and sophistication of superb one-touch wireless remote control operation, you will be able to create the perfect home cinema experience to enjoy yourself or impress guests. Posted on 22nd July 2011 by Chris. Are you a victim of the 'snooze' button on your alarm clock and have to really fight to get out of bed at the time you had originally intended? Controliss electric blackout blinds may be able to contribute towards awakening you enough to get out of bed, if not solve the problem entirely. Just as Controliss blinds can help you drop off to sleep by blocking any external light that is preventing you from doing so, at a single touch of a button, they could also help you to get up by reintroducing the daylight into the room at a time specified by you. The Air Spirit 30GMT controller can be programmed to operate all Controliss 240V mains Powered roller blinds and wood blinds at any desired time of the day, 7 days a week. So you could set your window blinds to open automatically on the weekdays when you need to wake up, and then have them open at a later time or even until you use the remote control to open them yourself at the weekend. It will be much harder for you to hit 'snooze' and go back to sleep if the sun's glare is illuminating the bedroom. If the sunlight alone is not enough to stop you from dropping straight back off to sleep, here are some other ideas that you could add to your morning wake up routine. 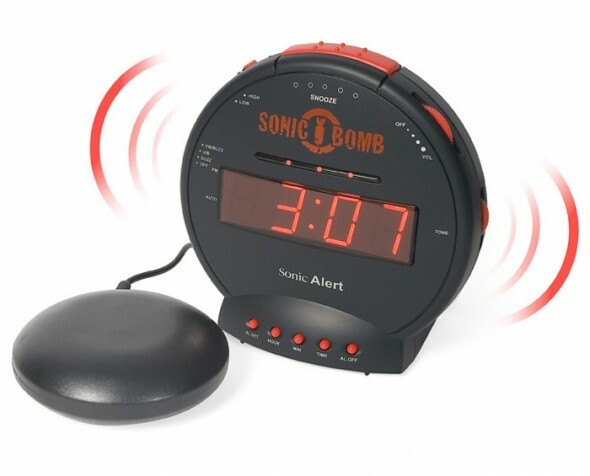 A popular waking mechanism is the Sonic Bomb Alarm Clock. It features an alarm tone that is adjustable up to a volume of 113db, which is louder than having a high revving chainsaw in the room! On top of that, a vibrating unit is supplied that will shake under your pillow or mattress and pulsating flashing alert lights will conduct a display to give that extra prompt to get you wide awake. The Sonic Bomb may seem somewhat over-the-top, but as is often said: 'Time is money', and if this device is too much of a wake up call for you, there is an alarm clock that takes the saying quite literally. Although currently in the conceptual stage, and therefore unable to purchase right now, the darkly humorous Shredder Clock may motivate you to get up on time in the mornings. This is, in effect, a cash-note sized paper shredder on a timer, that will operate at a certain time unless you get up to switch it off. The concept is a good-looking device, backed up by a very good idea since the incentive to getting you out of bed is stopping whatever you have placed in it, be it money or even precious letters or pictures, being cut into ribbons. Your brain will often work very differently, when it is just waking up, to the way it works at any other time of the day. So if you need to get up on time in the morning, it is important that the necessary awakening stimuli are put in place before turning in, to prevent you from oversleeping. Posted on 26th May 2011 by Chris. There is nothing like a good night's sleep to revitalise your body and mind. A lack of sleep doesn't just make you grouchy, it can have a negative effect on your metabolism, cardiovascular health and your immune system, as well as reducing your ability to learn and focus throughout the day. There are many ways to improve the quality of our sleep and the speed at which we manage to drop off, such as, reducing distractions, improving comfort, or even taking advantage of sleep assisting technology. One really cool and easily achievable step, is to remove as much light in from the room as possible. As summer is fast approaching, the days are getting longer; meaning even if you find the time for an early night, that last remnant of daylight is likely to prolong the amount of time it takes you to fall asleep. Controliss Blackout Roller Blinds are the perfect solution. With a wide selection of light blocking fabrics to choose from, you can pick a design that will look exceptional from the inside, as well as halt any light trying to enter from the outside. Not only that, you can lower any and all of our remote control Roller Blinds in the room with the single push of a button, since the range of Controliss blinds Air wireless controllers can be programmed to command up to 99 remote control window blinds simultaneously. This is not the only technology out there that may be able to help you get your forty winks. There are various devices on the market that can play tranquil sounds that aim to help block out external sounds while relaxing your mind and help a lot of people get to sleep. These sounds are even available to download in the form of smart phone apps to play through your phone. Some sleep difficulties are not sourced externally, health care company, LifeWave, can offer the Silent Night sleep aid patch to help give safe relief from sleeping problems including insomnia. This patch uses nanotechnology to enhance the production of delta waves (waves occurring in our brains during sleep) to lengthen the stages of deeper sleep our bodies go through, resulting in a better quality and more consistently long night's sleep. Needless to say, you could, if you haven't already, try the traditional remedies a nice glass of warm milk to help boost your sleep pattern; but if this proves ineffective, I hope this blog has given some ideas to sleep on. Posted on 2nd November 2010 by jenny. For most of us, the idea of renovation often entails some new pillow cases, a fresh coat of paint, or new flooring. However, renovation does not only mean transforming your home into a visual haven; you can actually shave off a few pounds from your annual electricity bill in the process of your interior makeover. According to energy-efficiency experts, a few changes in your lighting and window coverings can lead to significant energy savings. We let you in on a few of these cost effective and do-it-yourself energy-efficient secrets. 1. Install blinds with good quality light efficient fabrics on windows that are vulnerable to the sun. The sun’s hot rays during summer will drive air-conditioning bills sky high so install new window blinds that will help block out the sun. The Controliss blackout roller blinds including Estrella Acorn and Estrella Ice in luxurious fabrics are great neutral-coloured remote-controlled blinds that will also help prevent unwanted heat loss during the winter months. 2. Choose suitable bedding to keep the thermostat stable. Some of the best bedding available allows adjustable layering so that you can adjust according to the room’s temperature. Experts recommend that thermostat should be set from 28-30 degrees during the day in autumn or winter months. For warm months, keep your thermostat setting at 20 degrees or slightly higher, the mid-day sun will soon heat the house up after a brisk morning. Maintaining the thermostat at a low setting can save you up to as much as £200 per year. 3. During winter, look for ways you can warm up your home without turning up the heating. For example, you can drape your sofas or chair with warm soft throws that can keep you warm. Adding a few plush area rugs to a cold floor made with any type of material can save you some money from your heating bills. 4. Fans can keep people inside a room three or four degrees cooler and use no where near as much electricity compared to air conditioning. To decide on the size of fan you'll need consider the room size. A room that is around 50 square feet needs a 29-inch fan. For a 75-square feet room, you need a 36-inch fan. Look for an Energy Saving Recommended seal in your fans to find the most energy-efficient product. 5. Efficient lighting should be foremost in your renovation plans as 10 percent of your energy bills goes to lighting. Consider localised lighting so that you don’t have to rely on overhead lighting for small jobs. Use compact fluorescent bulbs for all your lighting needs as they use 75 percent less energy than incandescent light bulbs. CFL bulbs are more costly than ordinary light bulbs but they can last 10 times longer and don’t heat up like halogen lights. CFL bulbs can save you around £45 during their life cycle. 6. 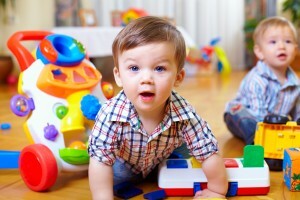 Try not to block heating or air conditioning vents with furniture or soft furnishings. Choose window blinds over curtains to prevent fabric from covering air vents. 7. Energy-efficient appliances with Energy Saving Recommended badges are highly recommended by experts. Consider replacing appliances that are 10 years old (such as a CRT TV) as these appliances cost about 50% more to operate. If you opt for these old appliances, you may add around £37 a year to your electricity bills.